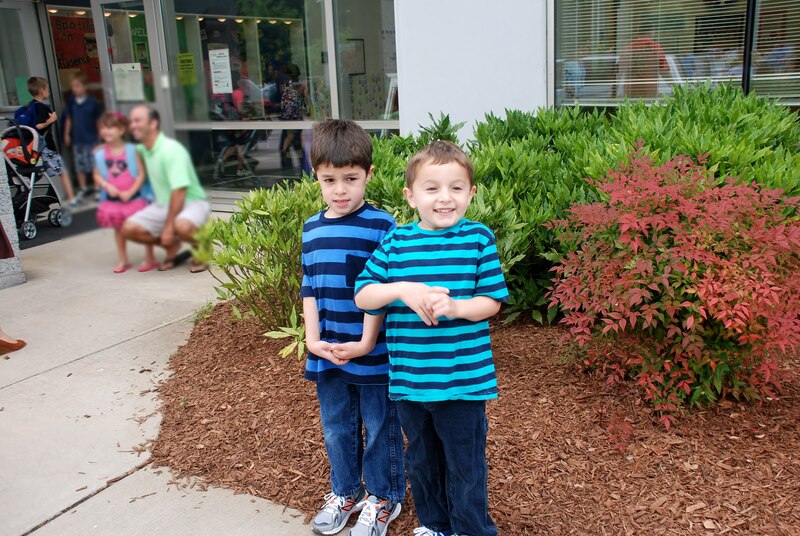 Well, the boys finally made it to Kindergarten! They did very well on their first day Thursday, July 11. It was a full day of school, but not with the full class. We drove them to school and walked them in to class. There was a sign-in sheet to include our names and emergency contact information for that day. The boys got a name tag each and found a seat. Their bags went in to a cubby and school supplies on the floor. Immediately, Cameron found a seat. Kiefer needed a little persuading, but he found a seat in front of Cameron and started to draw. They got to meet all four teachers (2 teachers and their assistants). They got to meet a few of their potential classmates since that was only part of the assessment week when the teachers get to meet each student, talk to them and assess what level they are at, and then determine which student will be in either class. They are aware that I requested our boys be in separate classes and I think that is preferred in schools anyways so I’m not concerned they are going to be in the same class. I asked them how they felt about the teachers. I didn’t get a clear answer. I’m not sure how to take that since before they met their teachers, Cameron was certain he would want Ms. M., because she posted a picture of herself on her profile on the school’s website. Kiefer didn’t seem to care either way. I got to meet the head of the cafeteria. She was very nice. I mention her because we got to talking about my boys’ teachers and she among just about everyone else I’ve spoken to say some really high remarks about Ms. B., the other track 2 teacher one of the boys will get as a teacher. No one seems to know much about Ms. M. other than that she’s new and no one has any complaints about her and that she seems very nice. That’s a good thing. I met her and she really does seem very nice! The next day on Friday, I will be meeting the teachers again and will know who has what teacher. I will also get the class lists. I’m supposed to bring in the boys so I assume the teachers want to tell them which class they’ll be in themselves. Meanwhile, I took the necessary first day of school pictures required by most parents and their families. I’m a little bummed it was raining when they got home. I’d have taken a picture of them getting off the bus for the first time. They tell me that was their favorite part of the day. I can understand that! Taking the bus for the first time without Mommy or Daddy on board is a big boy thing, a right of passage, and they were definitely looking forward to that all week! Cameron said he was sitting next to a couple of girls while Kiefer said he was sitting next to our neighbors. Kiefer seemed very proud of that. I’m thinking we are going to carpool in the morning most of the time. The bus will be arriving at about 8:30am, which isn’t bad at all, but it will be easier to leave our house 15-25 minutes later to drop them off ourselves. The school is only about 5-7 minutes away from our home. The carpool line in the morning moves quickly so it’s not as much of a madhouse as I’d have imagined. However, I heard that the afternoon carpool lines can be long and take longer to get through since packing kids in to a car does take longer than letting them out …usually. I’m going to let them take the bus home. Apparently the bus does not have seat belts except the front seats. That part makes me nervous not to mention a bit surprised, but it’s a short ride, and I’ve heard most buses around here are built that way. Not sure why that is. I understand the newer buses are being built with seat belts in all seats, but I guess older buses are not required to install them. …at least for now. I don’t know, apparently it has worked well without the seat belts. I’ll trust the system for now. The bus driver also seems nice. The vice-principal herself told me this driver has been the driver for this route for a long time and has been very reliable and careful. UPDATE: I now have the class lists (well, not really, It was pasted on the walls in front of the classroom so I was unable to take one home). Cameron got his first choice of teachers. He has Ms. M. with Mrs. H. as an assistant. He is as thrilled as they get! Ms. M. is newer to the school. She’s young, compassionate, and confident. I spoke to her about Cameron’s occupational therapy, and she was very happy to see that I was an open-minded parent. There had been issues in the past when she’s had a student that could use the extra help and the parents get defensive when she suggests it. Extra help being having extra time for tests, able to get fidget toys and move & sit seats during class, etc.. It’s possible she may have suggested therapy too, but I didn’t ask her questions about it…not my place to do so. Maybe it was her approach…, but when she talks to me, she really does not come across as combative in any way. I know parents can become protective. Anyway, she said she wants to watch him further and see if he needs to be put on the 504 plan. She has Cameron’s occupational therapist’s information if she has any concerns. She said when she spent the day with Cameron on Thursday, he was very focused and very interested in joining in with the class. Mrs. H., the assistant, is very nice. She seems like a sweet and patient lady. She’s got white hair, helpful, and was approachable. I’m not sure how I feel that Kiefer got her confused with me and almost gave her a random hug. I’m sure she liked that. Kiefer’s Teacher is Ms. B. with Ms. V. as her assistant. Ms. B. is a little older than Ms. M.. She’s a VERY sweet lady. She seemed very open to talking with the parents about ANY concerns they have. She offered to let me know if I ever wanted an extra consultation on how Kiefer’s doing, she’s happy to set one up. She explained that once a week for 5 straight weeks then one week off, the class goes to the media center (AKA the library), and the kids are encouraged to take a book out and read it at home. They are expected to return the book the following week. Then eventually, they’ll be asked to take home two books to read. This, funny enough, was what Kiefer wanted to know most about. He was very excited about the library books. I also mentioned to her about Kiefer’s big creative imagination. Lately, Kiefer has been putting on shadow shows for us at home. They don’t come out great, but I applaud his enthusiasm. I think it’s wonderful watching him and Cameron come up with songs (scary and silly are their favorite ones to sing) as well as dance about and act out something. Ms. B. said she’ big on plays and puppet shows. I think she’s a great match for Kiefer! Ms. V. was very bubbly and talkative. She’s also got a good sense of humor which was quite refreshing. I think her energy will help Kiefer tremendously with his shyness. Ms. B. said Kiefer was quite the talker after Jason and I left them in the classroom so she’s pretty sure Kiefer will not be shy at all while in that classroom. Ms. B. also mentioned that when they get homework, there will be a folder in their bookbags with that information to be taken out at home. The empty folders are to be returned the next day, but the homework will be due at the end of the week. The boys also got their seat assignments. Their chairs each have a pouch with some school supplies in them as well as their name on the table at their spot or on their assigned chair. 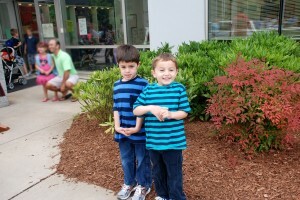 Both boys happen to be sitting in front of their teacher’s desk in each of their rooms. Coincidence, I’m sure. Kiefer is sitting closer to the front of the room with a girl and a boy. Cameron’s seat is more towards the back with two girls and a boy. The boys also have cubbies assigned to them. It’s a bit surreal to be walking through these classrooms now seeing our boys’ names on the tables, chairs, and cubbies. 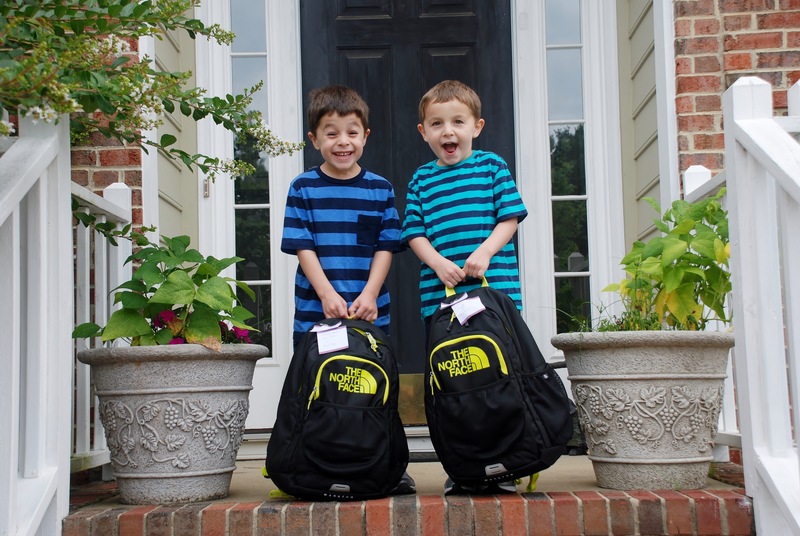 Starting Monday, Cameron and Kiefer start school in their own classrooms with their full load of classmates. It’s going to be interesting to hear how things went on their first official day of school. This will also be the first time we parents aren’t allowed to walk them to their classrooms. It’s definitely going to be a big step for all of us!